EcoMerchant is Canada's One Stop Shop for Eco-Friendly Products. 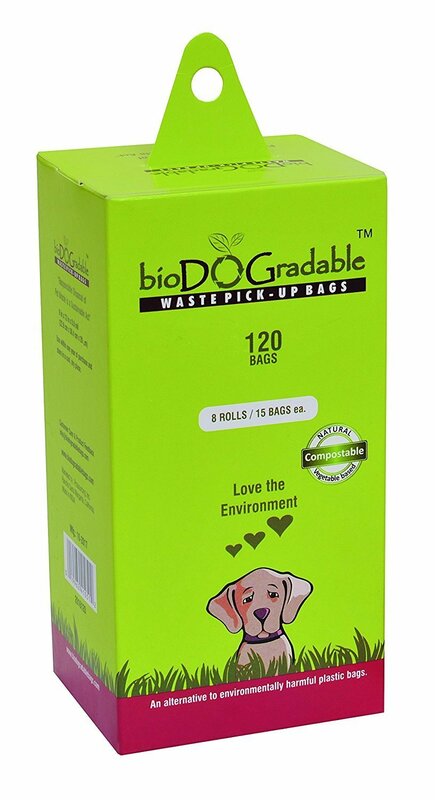 This pack of 8 rolls of 15 bags each (120 bags) is perfect for pet owners who love bioDOGradable bags and have multiple dogs! We made sure that our bags hold up to 4 pounds of dog poop so you can use them to pick-up after your Chihuahua and you Great Dane. These pet waste bags are chemical-free, plastic-free, and unscented, this means we made our bags from the perfect material which enabled us to get our bags certified from USDA as a biobased product and certified by TUV Austria and EN 13432 as industrial and home compostable. These bags are leak-proof and will fit in any leash dispensers, so now you can take you dogs one a walk without having to worry about any funny business. 100% home compostable! We are promoting everything eco-friendly. We are trying to do our part to help save the planet. Please some support us on our journey to make the world a eco-friendly. We are eco-minded people who do the most out of our daily life to make this place greener. Well, not too bad of a store. I'm a long time fan of Jack N Jill so figured I would see if online would save me some driving and gas money! The Reason to Choose Us! More and more people are aware that we as a species on this little blue planet need to be doing much, much more to keep it green. We will carry more and more products but only those that use natural ingredients, reduce waste or have a true socially conscious focus. It all starts with you and us! Need Help? - Talk to Us!